Yes, I’m still playing with the crochet wire … I hope you’re not sick of seeing it yet because I’m actually loving it! 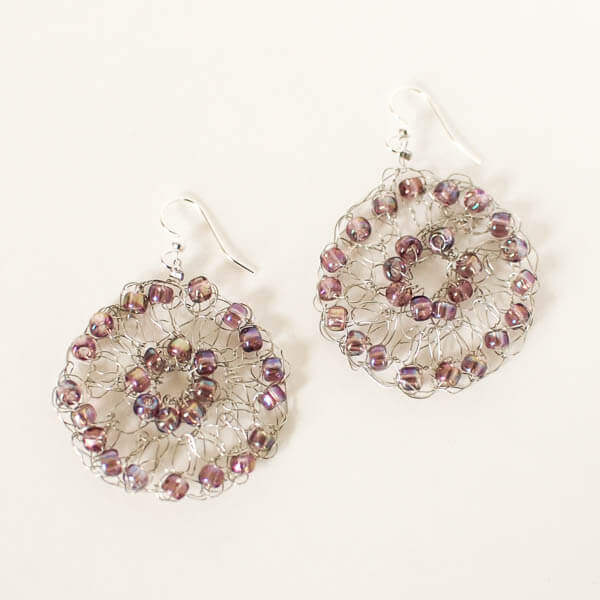 This time I tried adding some beads to wire to make these pretty medallion earrings. Very fun! Beaded Double Crochet (bdc): Yarn over, insert hook into specified stitch and draw up a loop, yarn over and pull through 2 loops, move bead up the wire to rest next to hook, yarn over and pull through remaining 2 loops on hook. Thread 24 beads onto your wire. Round 2: Ch 2, move 1 bead up to hook, ch 1 (counts as 1st dc), work 1 bdc in same st as join, work 2 bdc in remaining sts around, join — 16 sts. Lovely! Just love crocheting with wire also, but have problems with the crimp beads eventually cutting through my wires 🙁 any advice? These are divine, Kara. Love them!